Hydrangeas are one of the classic seaside plants, flowering mostly from mid to late summer they will bring colour to any garden. Most hydrangeas will tolerate either full sun or semi shade and will be fairly happy in a moist position in the garden where it doesn’t dry out too easily, as a rule the drier the soil the more shade that is needed. Hydrangeas have the ability to grow really well in containers. With many different hydranges being available it is often difficult to pick a good variety. For a small garden ‘Annabelle’ is a freely flowering plant with white flowers and because of reliability is appearing more in planting schemes, it is also now available in the more traditional pink too. One that I like is the good late-flowering ‘villosa’. This can grow to 10’ and so isn’t the ideal choice for a small garden but in the correct setting it has flowers that are blue in the centre and lavender to white outers. But for a more normal sized plot a choice from Hydrangea macrophylla will give a good plant with names such as ‘Blue wave’ and ‘Blue Bonnet’ and also ‘Lanarth white’ giving a fair description of their colours. The colour of hydrangea flowers is all down to their ability to absorb aluminium and iron from the soil which can be stopped when the soil becomes alkaline. This is where the blue hydrangeas start to turn pink but by applying iron sulphate the flowers return to blue. Within reason, the lower the PH of the soil the deeper the blue. 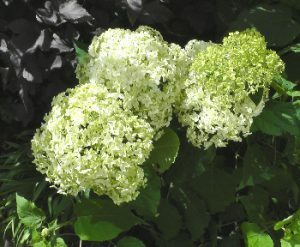 However this does not apply to white hydrangeas whose flowers will stay white whatever you do. A regular feed of a general fertiliser is a good idea but as with most plants too much nitrogen will make the plants grow and not flower very much. After flowering many of the hydrangea flowers tend to go a bronze colour as they dry out and can look very attractive. It also said to benefit the plant to leave the flowers on (although to what degree I don’t know, and I never have) by adding some protection to the dormant buds that can be sensitive to frost. Hydrangeas are best pruned in spring. With such a straggly looking plant and a tangle of woody stems it does seem impossible especially on older plants. Whenever I’ve been pruning hydrangeas back I’ve followed what I’ve always been told and removed all stems that are more than three years old, although on old plants it’s best to remove only two thirds of the older stems this first time. This lets light into the centre of the plant and promotes new growth and leaves the one and two year old stems to flower. Finally there is a climbing hydrangea. H.petiolaris that will grow even on a north facing wall. It has white flowers although may not flower well when young. This will climb without the need for wires and is therefore very useful for supporting a clematis, try Clematis ‘The President’ for a north facing situation.